Oby's Blog: Amber Rose & Blac Chyna Take Time From Their New Men For A Girls Day Out… On Motorcycles! 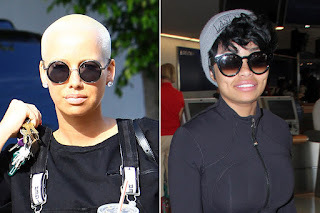 Amber Rose & Blac Chyna Take Time From Their New Men For A Girls Day Out… On Motorcycles! Ahh! This looks like so much fun! Following VERY public splits with their rapper exes, Amber Rose and Blac Chyna have become such good friends! So on Thursday, the BFFs decided to have a girls day out in Encino, California by taking their three-wheel motorcyles for a spin! They're ride or die b*tches!